Well, it’s not quite winter but we did have a little flurry and the light is now that winter light that fills the windows when the trees are bare. Bean sat quietly on the wardrobe after his bath and the angle was perfect. He is not reflecting in the mirror, but he is reflecting, and really I wanted to call this “reflecting” but I’ve used that a bit much, hence the longer title. I drew this in one of the 12 shades of gray pastels, shade number 8 to be exact. These grays are rather warm grays and when used alone they have a distinct grey-green, or verdigris, tone. This one resembles a pewter or antique silver which I wanted for the tone of the drawing: softer, not black; warm; antique. 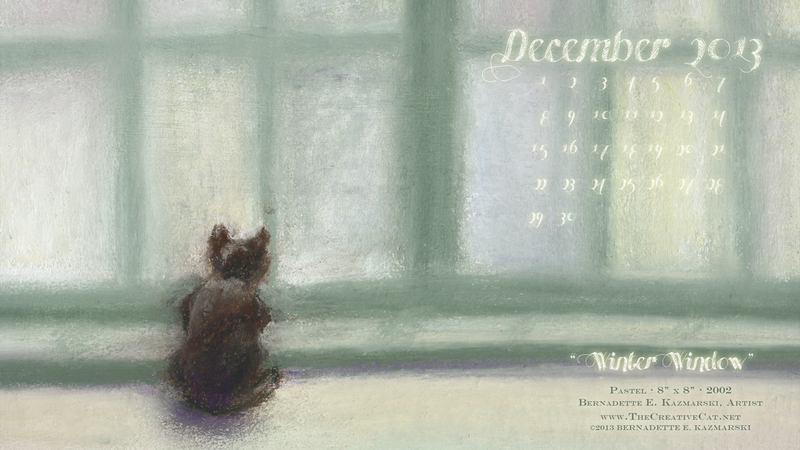 “Winter Window” desktop calendar for wide and HD monitors. That softer antique look comes across perfectly!